The What: Ricoh has begun shipping the D2200, a new, portable solution that supports the ever-growing mobile workforce and the increased need for more collaboration in smaller, shifting spaces. 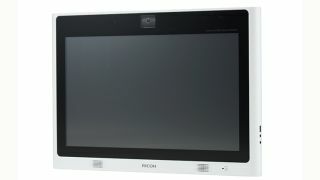 The new RICOH Interactive Whiteboard D2200 unifies experiences from several standalone devices such as interactive whiteboards and videoconferencing systems into a portable 21.5-inch package to facilitate dynamic work styles. The What Else: With more remote workers, meeting spaces and offices are transforming, and often becoming smaller. As a result, the variety of devices needed to keep information flowing grows larger, leading to clutter. The Ricoh D2200’s flexibility is well suited for those who need to share their ideas with the right people as quickly as possible. Its 21.5-inch screen can function as a user’s enhanced desktop monitor, or as a videoconference tool with its embedded video camera and microphone. It can also be wall-mounted for presentations and lessons, placed on a desk, or carried between sales calls and offices to foster flexible collaboration. With four-point touch control, in-person collaboration is also made easy. The Ricoh D2200 combines the benefits of precise touch control with the power of organizations’ existing applications and platforms. Leveraging Ricoh’s Workstyle Innovation Technology, users can also share their work wirelessly with larger groups in conference rooms and auditoriums without compromising interactive features. The Ricoh D2200 connects to tablets and smartphones, along with Ricoh Business Projection Systems and printers, via the Ricoh Smart Device Connector app to complement today’s mobile and BYOD-driven work styles. Each whiteboard can connect with up to 20 other locations, so teams can receive immediate feedback from one another. Annotated and marked up presentations from the Ricoh D2200 can be saved to a shared network directory, USB drive, or even temporarily on the whiteboard’s solid-state drive so that brainstorms live on beyond meetings and the device. The Ricoh D2200 also features a number of security features to help ensure that workers remain in control of their content. A pin number can be attached to every invitation to control access to presentations. Unsaved presentations are automatically discarded when the Ricoh D2200 turns off, and can also be deleted so the next whiteboard user won’t have access to it. Saved presentations can easily be transformed into a password-protected PDF file and shared securely with other recipients moments after a meeting. The Bottom Line: For both in-person meetings and videoconferences, the device can be used to present, share, and annotate designs, blueprints, lessons, and other presentations securely, and help keep participants on the same page. Its small footprint makes it well suited for today’s mobile-driven teams, and smaller offices, conference rooms, and huddle rooms. The D2200 is available now at a suggested retail price of $2,499.